The New TL3100V Recordable Voice Monitor works as a pull-string monitor or sensor pad monitor and has the added ability to record a personalized message to be played back when the alarm is activated. It allows the residents to hear a melody or a familiar voice instead of a frightening alarm sound as resident attempts to get out of bed or up from a chair. Residents are not frightened by a loud alarm, when they attempt to get out of bed or a chair. Caregivers or family members can record a personalized message, like, “Please sit tight Mrs. Jones, help is on its way.” or, if preferred up to a 15 second clip of the residents choice of music. Prevent false alarms when using pull-string monitors by adjusting the cord stop to desired length. The Recordable Voice Monitor TL-3100V works with all corded Smart Caregiver pressure sensing pads and floor mats and easy release seatbelts. This Monitor was designed without an ON/OFF switch, which means it is ALWAYS ON and cannot be turned off. Caregivers use the easily accessible Alarm Reset Button to silence the alarm and attend to resident needs without the potential for accidentally leaving alarm off. 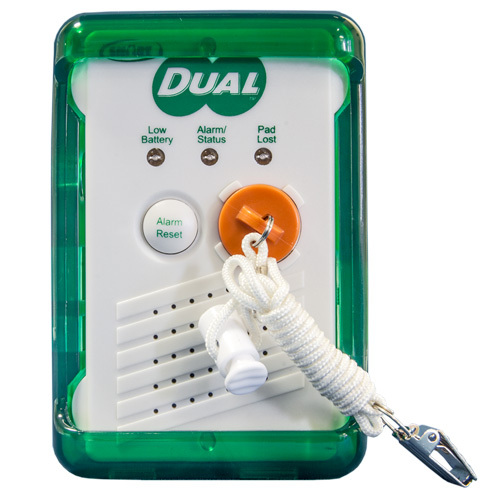 Click the button below to add the Voice Recordable Dual Pull String Exit Monitor ONLY to your wish list.